Houghton is a pretty little village joined together with the village of Wyton and about halfway between Huntingdon and St. Ives. It lies close to the River Great Ouse and has a rather impressive mill. 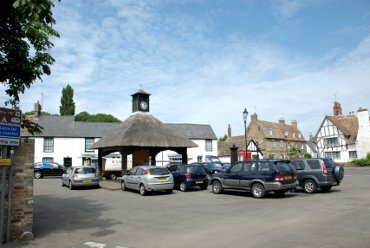 This is the little village square called 'The Green' together with its clock tower. It probably was a green at one time but there's no sign of grass now. 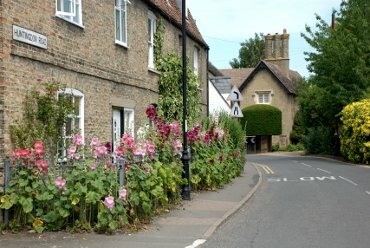 This view is seen from the top end of Mill Street looking towards the house with the Hollyhocks shown above. Part of the crooked house, shown below, can be seen on the right. 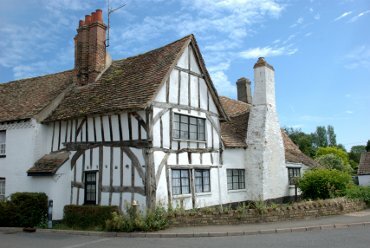 This rather nice medieval timber-framed building is known locally as the 'Crooked House'. 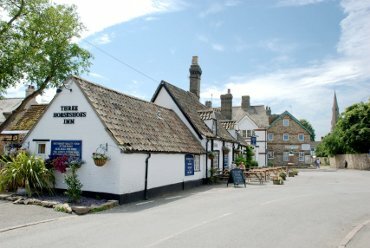 The Three Horseshoes Inn, where we stayed overnight on this short trip, overlooks 'The Green'. The brick wall on the right edge of the picture is the start of Mill Street with the church spire showing above the trees.